So excited to share this A-D-O-R-A-B-L-E Winnie the Pooh baby shower cake sent in by one of our readers! Talk about eye candy...Isn't it cute?! Love the crisp colors and the cute characters. This cake was made for a friend's "Winnie the Pooh" themed baby shower. This cake was a 10 inch cake, 3 cake layers of white velvet and chocolate velvet, iced with a vanilla bean buttercream and covered with a buttercream fondant. The figurines were hand created with basic white gum paste, Wilton color gels were added as needed. The bee hive is also cake, covered in vanilla bean buttercream and covered with a yellow buttercream fondant in strips to cause the effect of a beehive look. The clouds are a blue buttercream fondant. I used a flower design cutter and rolling pin to stretch in the effect of a cloud image. The bees are actual push pins (not edible) as my friend is a teacher and can use them in her classroom after the fact. I looked up numerous ideas on the internet prior to making my cake, and decided on the overall design as I went. 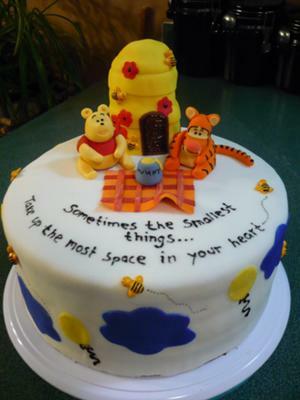 I had left over cake pieces, hence where the idea of the bee hive came from, and the quote on the cake is written on the wall of the child's nursery along with Baby Tigger and Pooh images. Helpful tips I learned from making this cake would be the time it takes to make the figurines, they took longer than I had suspected they would to create, but I was very happy with the outcome. This cake is so creative! It must have taken hours to do...one of my favorites by far.